This page provides an overview of the impact of the Mead-Conway innovations in VLSI design methodology, and of the rapid-chip-prototyping system innovated by Lynn Conway at Xerox PARC (demonstrated during MPC79, and later becoming the MOSIS service). For more background on the Mead-Conway work itself, and links to many original documents from the period, see Lynn Conway's VLSI Archive and the annotated list of references. See also Chapter 4 in the National Research Council historical book Funding a Revolution, which provides further details on the impact of the work. In late 1979 and on into 1980, following a period of intense research activity at Xerox PARC and Caltech, the work of the Mead-Conway team suddenly achieved many successes and began to have great impact. The Mead-Conway text was published in late 1979. Lynn Conway's new Xerox PARC MPC VLSI implementation system and service was operated successfully for a dozen universities in late1979. Mead-Conway VLSI design courses, based on Lynn's 1978 course at M.I.T, spread rapidly into scores of top universities throughout the world. "California Institute of Technology professor Carver Mead and Xerox Corp. computer scientist Lynn Conway wrote a manual of chip design, "Introduction to VLSI Systems." Demystifying the planning of very large scale integrated (VLSI) systems, the text expanded the ranks of engineers capable of creating such chips. The authors had observed that computer architects seldom participated in the specification of the standard integrated circuits with which they worked. The authors intended "Introduction to VLSI Systems" to fill a gap in the literature and introduce all electrical engineering and computer science students to integrated system architecture." In 1980 the Defense Department's Advanced Research Projects Agency (DARPA) began a new VLSI research program to support extensions of this work, resulting in many top-rate university and industry researchers becoming involved in following up the Mead-Conway innovations. Lynn's MPC technology was transferred to Xerox PARC to USC-ISI to become the foundation for the MOSIS System, which has been used and evolved since 1981 as a national infrastructure for fast-turnaround prototyping of VLSI chip designs by universities and researchers. Only two years into these successes, the work began to receive public recognition, the first being Mead and Conway receiving Electronics magazine's 1981 annual award for achievement (PDF). The Mead-Conway text was translated into Japanese, Italian, French and also Russian (in an unauthorized version printed by the gov't and distributed amongst Soviet engineers). By 1983 nearly 120 universities around the world were offering the Mead-Conway VLSI courses, and other countries also began operating rapid-prototyping infrastructure based on Lynn's MPC79/MOSIS innovations. The book eventually sold over 70,000 copies. During the '80s, many startups were based on this work. Doug Fairbairn from PARC, who had started Lambda, the Magazine of VLSI Design (later VLSI Design Magazine), became one of the founders of VLSI Technology, Inc. Jim Clark of Stanford, who had learned VLSI system design from Lynn Conway one summer at PARC, invented and designed the "Geometry Engine" chip and then prototyped it via MPC79. Jim went on to start-up Silicon Graphics, Inc., based upon his invention, and served as an entrepreneurial role model many others to follow. Many other VLSI system chip designs became the basis for start-ups, including the RISC designs exploited by Sun Microsystems. Hewlett-Packard reoriented much of their VLSI CAD work to exploit the new methods. Intel benefited directly from our work due to Carver Mead's long-time influence as a consultant to the leadership there. John Hennessy's MIPS designs became the basis for MIPS Computer Systems, and many new VLSI CAD companies including Cadence, Mentor Graphics, Daisy Systems and Valid Logic were also founded. All these efforts flowed out of the Mead-Conway methodological milieu and many were further stimulated by DARPA research funding. Much of this explosion in developments and applications of the Mead-Conway work and impacts of the MOSIS System are documented in a recent National Research Council Publication entitled Funding a Revolution. By the mid-1970s, digital system designers eager to create higher-performance devices were frustrated by having to use off-the-shelf large-scale-integration logic. It stymied their efforts to make chips sufficiently compact or cost-effective to turn their very large-scale visions into timely realities. In 1978, a landmark book titled Introduction to VLSI Systems changed all of that. Co-authored by Mead, the Gordon and Betty E. Moore professor of computer science and electrical engineering at the California Institute of Technology, and Conway, research fellow and manager of the VLSI system design area at the Xerox Palo Alto Research Center, the book provided the structure for a new integrated system design culture that made VLSI design both feasible and practical. Introduction to VLSI Systems resulted from work done by Mead and Conway while they were part of the Silicon Structures Project, a cooperative effort between Xerox and Caltech. Mead was known for his ideas on simplified custom-circuit design, which most semiconductor manufacturers viewed with great skepticism but were finding increasing support from computer and systems firms interested in affordable, high-performance devices tailored to their needs. Conway had established herself at IBM�s research headquarters as an innovator in the design of architectures for ultrahigh-performance computers. She invented scalable VLSI design rules for silicon that triggered Mead and Conway�s success in simplifying the interface between the design and fabrication of complex chips. 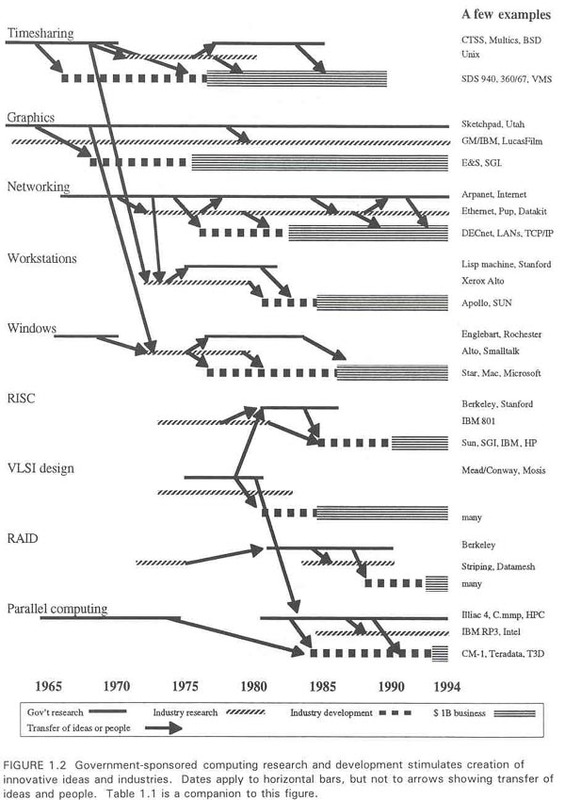 The structured VLSI design methodology that they presented, the �Mead-Conway concept,� helped bring about a fundamental reassessment of how to put ICs together. Figure II.13 Technological Developments in Computing. From [ISBN 0-309-05347-1]: Allocating Federal Funds for Science and Technology, National Academy Press, Washington, DC 1995, page 75. Note: History is always a work in progress. Each of these figures in the National Academy documents needs revisions on the lines labeled "RISC". Subsequent findings indicate that this line would be better labeled as "Superscaler processors", originating in the work of the ACS architecture team (including Lynn's innovation of multiple issue dynamic instruction scheduling) in 1965-66 at IBM Advanced Computing Systems. 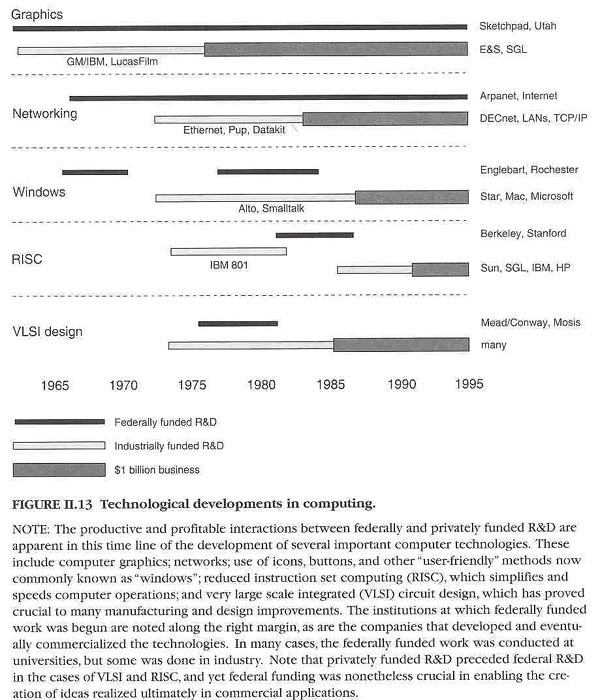 Thus Lynn's work impacted not only the "VLSI" stream of knowledge, but also the "RISC" (i.e., Superscalar) stream too.